Donald and Melania Trump arrived at the White House on Friday morning for tea with the Obamas,part of the inauguration tradition. The Trumps attended a service at St,John`s Church in Washington,D.C.before heading to the White House. 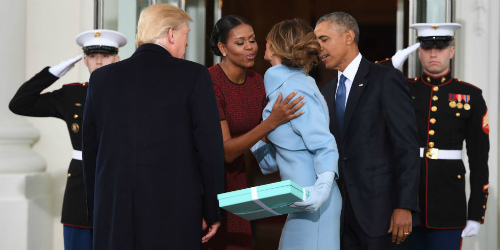 Melania arrived with a Tiffany box in hand, which she gave to Michelle,who was't quite sure what do with it. After exchanging pleasantries and smiling for the camera, the Obamas and Trumps headed inside the White House.